SP-401 aviation light is key element of solar helipad lighting. This intelligent lighting unit is solar-powered and wirelessly controlled. ICAO-compliant optics generates correct light output in terms of intensity and chromaticity. SP-401 is powered by deep-cycle battery that can be powered by solar panel, charging stations or stationary cable. Standard lighting unit is equipped with external military-grad external charging port. Separately installed solar-panel supported by maximum power point tracking ensures high-speed charging. Encoded wireless control and monitoring of the lighting unit is using radio transceiver and sensitive antenna. Lighting unit is equipped with external switch and battery level indicator. Those two are used mainly as a backup. Frangible mounting is used to fix SP-401 to concrete or asphalt surface. The lighting used at helipads needs to meet an array of requirements set by the International Civil Aviation Organization. The safety of night flight operations depends on the lighting. Since LED lightbulbs started to be used, there’s been a revelation in airport and helipad lighting thanks to the use of solar lighting. Stay with us and find out what it was all about. Today, we want to elaborate on helipad solar lighting – TLOF zone lights. Before LED lights were introduced to the market, airport solar lighting was used as an emergency solution – in case of the main system malfunctions or temporarily – for instance, during maintenance works of the main system. LED lamps not only work very long (will be discussed in more detail later) but also allow for the proper light intensity. Thanks to that, solar lighting started to be implemented as a permanent lighting solution at some airports and helipads. One can notice a few different zones designated within a helipad. Among them, the most important are the TLOF area (located in the central landing area) and the FATO zone that surrounds TLOF. TLOF refers to Touchdown and Lift-off area. FATO means Final Approach and Take-off zone. Both the zones can be in the shape of a circle, rectangle or square. Helipads that carry out night operations need to be properly illuminated. Not all of the helipads are equipped with a full set of lights but the following areas must be illuminated obligatorily: The FATO zone, TLOF area, wind direction indicator and taxiway. At least four green and omnidirectional lights are used to mark the TLOF area. If the area is in the shape of a square or rectangle, the lights need to be placed in the corners primarily. The distance between the lights depends on a helipad type. 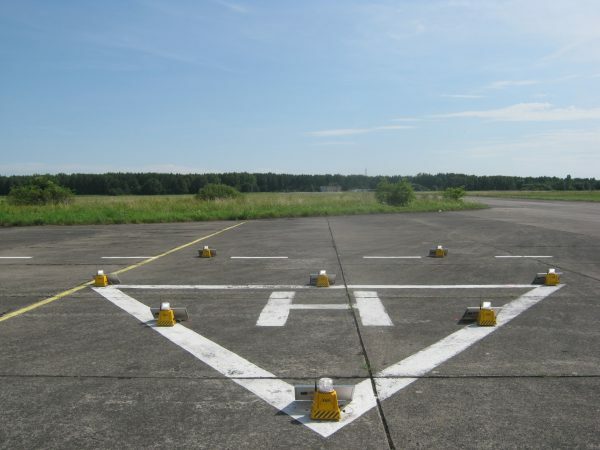 It is 3 meters for lifted helipads and 5 meters for ground helipads. The lamp cases cannot stick out above the helipad surface for more than 25 meters. If there is a threat of a collision with a helicopter, they need to be installed flat with the surface. 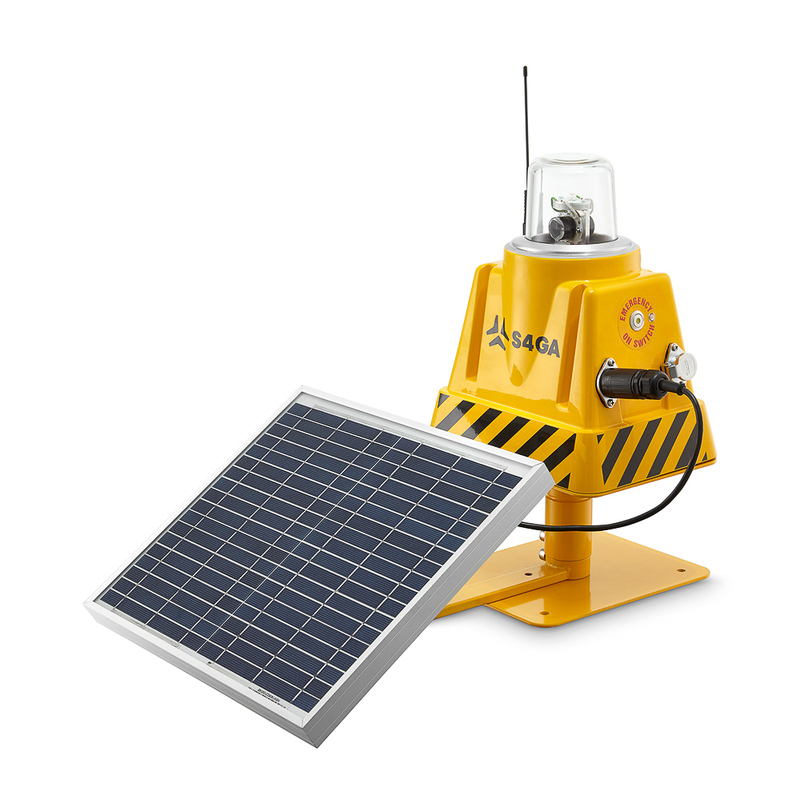 A fully-charged solar lamp will work for up to 85 hours if it is using its lowest-intensity level. If it is working in a maximum-intensity mode, the lamp will sustain 25 hours of work. The lifetime of LED lamps reaches 50 000 hours. Also, the lamps are equipped with an exchangeable optic warhead. We should stop at this point for a moment. The standard lamps used at the TLOF zone can withstand temperatures from -20°C to 50°C. However, the so-called arctic set can work in temperatures from -40°C to 80°C. When it comes to solar lighting (especially airport solar lighting where reliability is of primary importance), this one question always arises: what if there are bad-weather conditions? The newest solutions prove that the weather is not a problem anymore. Helipad lighting (including TLOF zone lights) can be charged in three independent ways. The first one is, of course, a solar battery. If needed, the lamps can also be charged by a charging station that is included in the lighting set. Finally, each lamp can be charged with an electric power grid. Both control and monitoring of TLOF solar lighting can be handled remotely. The range of the remote control is 3 kilometers, and it can be optionally extended. It is possible to control the lighting both from the air and from the ground. Either a pilot or an airport crew member can be the operator. The system is equipped with an emergency on/off switch and an automatic light intensity control system. It adjusts the light intensity level if the battery level is low. Both the parameters and the way the TLOF lights should be installed are determined by the International Civil Aviation Organization (ICAO), Annex 14. Moreover, the lighting used all across the European Union needs to meet additional norms: EN 61000-4-2:2009, EN 61000-4-3:2007/A2:2011, PN-EN 61000-4-4:2013-05, EN 61000-4-5:2014-10, EN 61000-4-6: 2014-04.